The best mashed potatoes are not too airy, seasoned perfectly, lump free, and have just the right amount of butter. 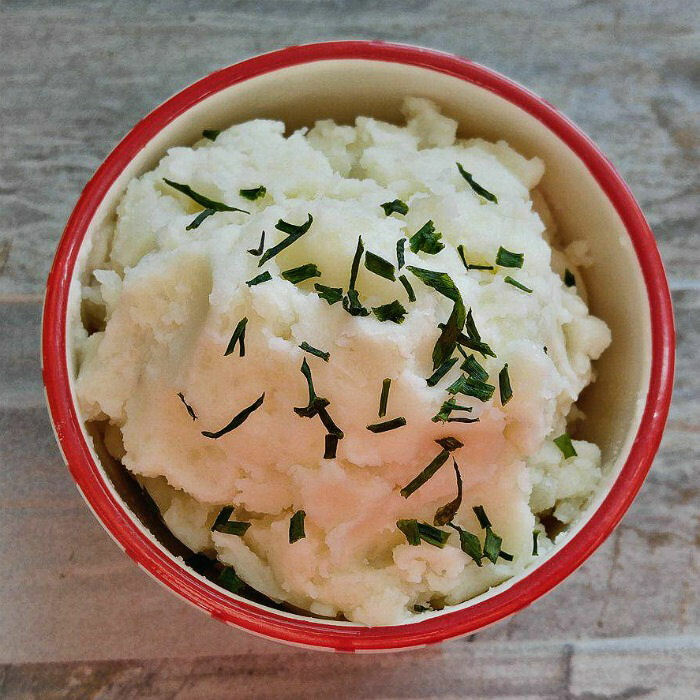 These cooking tips will show you how to make the perfect mashed potatoes every time. Nothing says comfort food to me like a bowl of creamy and fluffy mashed potatoes. Combining this delicious side dish with your favorite cut of meat can make any meal a heavenly event. A bowl of perfect mashed potatoes seems like an easy thing to prepare. After all, how hard is it to boil potatoes, mash them and add some butter and salt? But let’s be honest, we’ve all eaten mashed potatoes that lack fluffiness and are watery, not seasoned properly, and full of chunks. If you want to master the art of making perfect mashed potatoes, there are a few steps that you’ll have to take first. 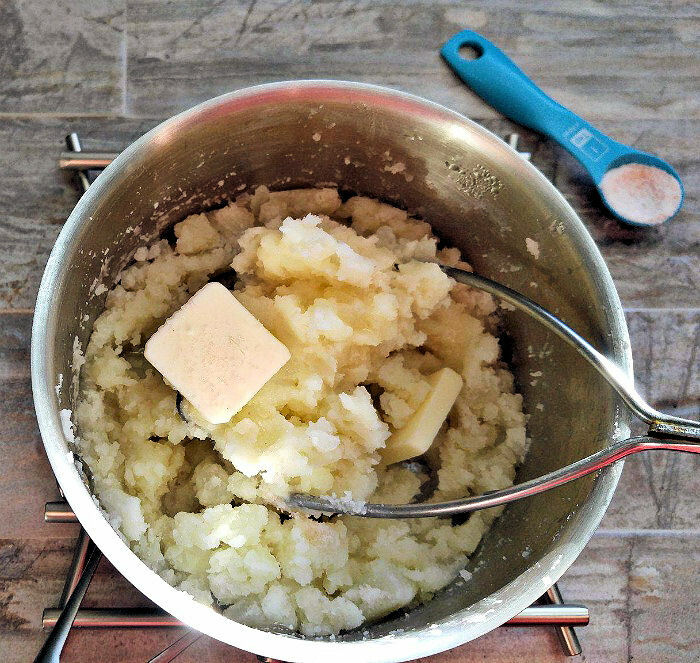 Getting started on making perfect mashed potatoes. Making mashed potatoes can be a tricky task. The trick is to make sure that the finished potatoes are not too thin and watery, not too whipped and airy, and not too chunky. What’s left? Perfectly fluffy potatoes that are thick but smooth with some denseness but not dry. These are the steps that I take to make perfect mashed potatoes every time. Before you can start the process of mashing the potatoes, you’ll need to make sure you are using the right potatoes for the job. 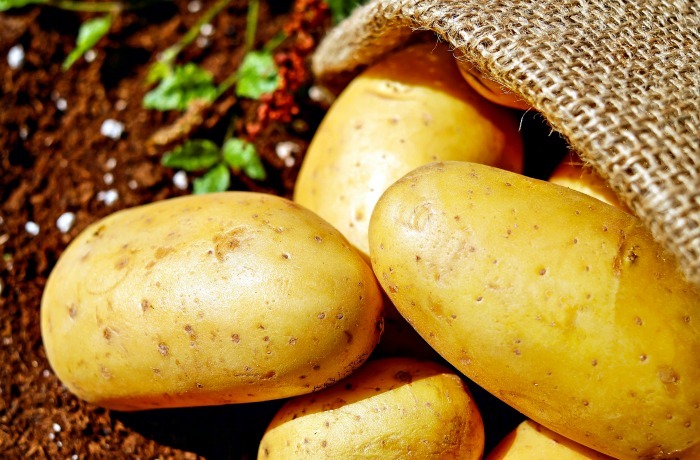 Be sure to choose potatoes that have a higher starch content, such as Yukon Gold, Long White Potatoes, or Russets. These potatoes will make the fluffiest pile of mashed potatoes that are more lump free. Starchy potatoes also absorb the seasonings more easily. If you use waxy potatoes like red potatoes and some white varieties, or fingerlings, they will become too creamy. We want the pile of potatoes to be fluffy but also to hold up well. The size of the cut matters. Just like all vegetables, if you cut them into uneven chunks and throw them in some water to cook, some pieces will cook faster than others. That will mean watery pieces when you try to mash. To combat this problem, make sure that the potatoes are cut into very even pieces. I cut them in long thick strips first, the into even sized pieces, discarding the pieces on the end that are smaller. I like to add my salt (and pepper if you like them this way) before I cook the potatoes. The allows it to permeate the water that the potatoes are cooked in giving each piece of potato some seasoning. And if you like garlic mashed potatoes always add the sliced garlic with the potatoes. Nothing is worse than fluffy mashed potatoes with pieces of sharp garlic destroying the taste. Cooking the garlic with the potatoes will lessen the bite of the garlic. You will be tasting and adjusting the seasonings later as well, but adding the salt (and pepper if you like it) now will help to get perfectly seasoned potatoes at the end. Cooking Tip for extra flavor. Instead of using water for my mashed potatoes, I often cook them in chicken stock. In this case, seasoning is not as much of an issue, since many chicken stocks have some sodium in them. This type of cooking adds an extra layer of flavor to the finished mashed potatoes. Don’t be tempted to crank the heat up and cook the potatoes quickly. If you do, you’ll likely have a few burned pieces that stick to the bottom of the pan. (and even if you cut these burned parts off, you will still taste them in the finished mashed potatoes. 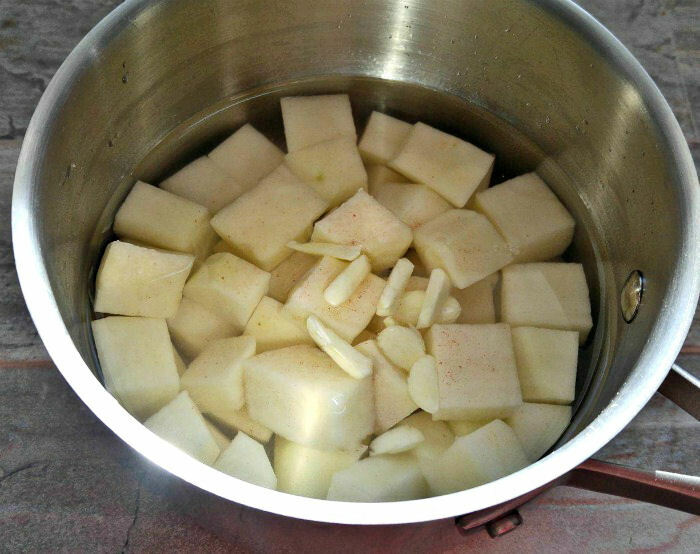 Start with cold water, bring the pot to a boil and then reduce the heat and simmer until the potatoes are tender when pierced with the tip of a knife. This is an important step. 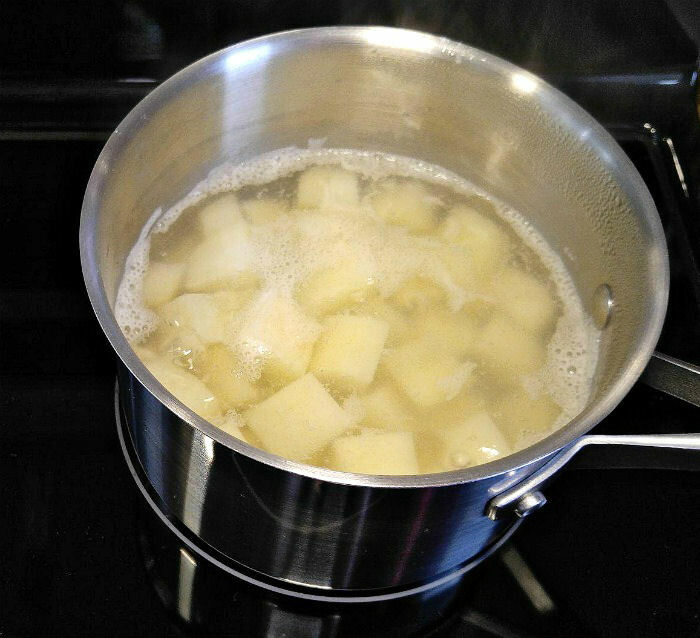 All boiled potatoes will retain some water after cooking. Drain the potatoes and return them to the same pan, covered, over a very low heat for about 5 -10 minutes before mashing. This will allow the excess water and insure that you don’t end up with watery mashed potatoes. If you have a glass top stove, the warmer area is the perfect spot for this step. It really is amazing what a difference this small step can make in the consistency of your finished potatoes. It’s Time to Mash the Potatoes! 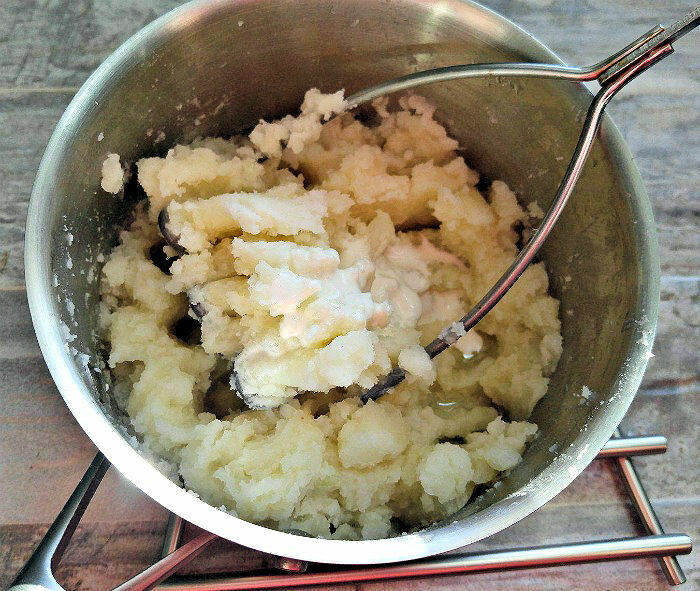 Adding butter as you start to mash allows the potatoes to have a nice firm texture before they are softened with the cream. If you add the liquid too soon, your potatoes will likely be too watery. I don’t generally add much in the way of seasonings to my mashed potatoes. Sometimes I cook them with garlic. Occasionally, I’ll add nutmeg (nice for Thanksgiving dinner.) I always use sea salt and rarely add pepper. What I do always do, though, is to taste as I make the potatoes. Each time I add something new to the mixture, I will take a bit of a taste to see how they are. I keep some sea salt near by to add a pinch between layers and always end up them perfectly seasoned. I always use heavy cream in my potatoes and find that I don’t need nearly as much as I would have thought had I added the cream before the butter. The butter has liquids in it too, and melts when it combines with the hot potatoes. 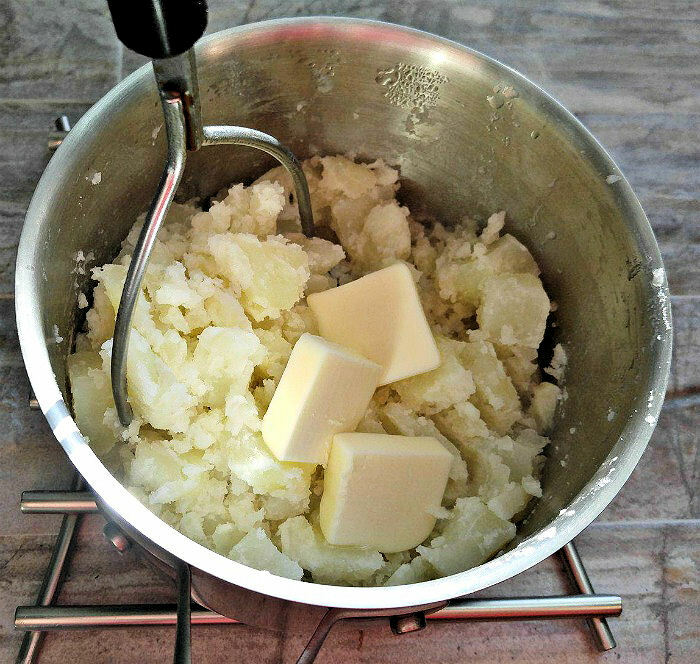 If you add the cream (or other liquid) after you have incorporated the butter, your consistency will be perfect. Fluffy, light and delicious! Be sure that the cream is at room temperature, not straight from the fridge so you don’t cool down the potatoes on the last step. Even though I don’t add much seasoning to my potatoes, other than salt, a sprinkling of fresh chives or and other favorite fresh herb can go a long way towards a delightful presentation! Tada! My perfect mashed potatoes, gently seasoned with sea salt and garlic. If you follow these steps, you’ll end up with fluffy and light mashed potatoes every time. The taste of my recipe is delicate with just a hint of garlic and sea salt. They are perfect to add as a side dish for any main meal. This recipe is a bit flexible. If you like both salt and pepper, you can add both. I like my garlic potatoes mild. If you prefer a stronger garlic flavor add more in the cooking pot. I enjoy my potatoes firm. If you like yours more creamy, just add more cream. The choice is yours. Just follow the general tips above with your adjustments and they will be the perfect mashed potatoes every time! For a reminder of this post for perfect mashed potatoes, just pin this image to one of your cooking boards on Pinterest so that you can easily find it later. 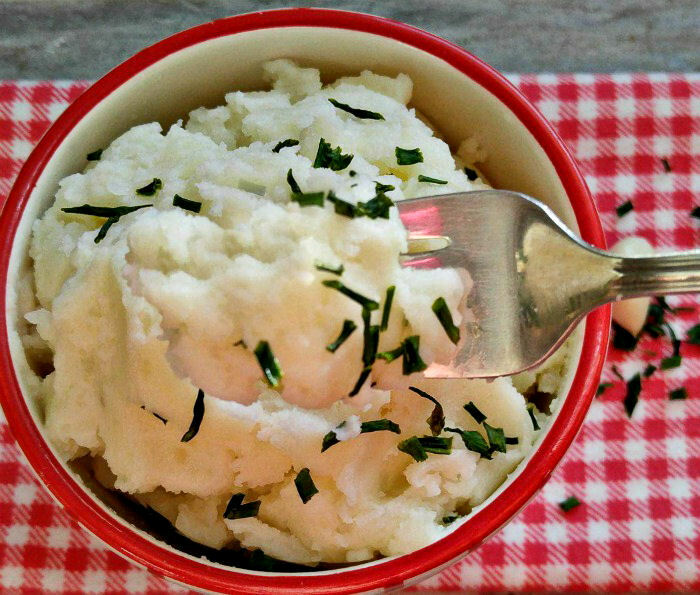 These delicious mashed potatoes are light and fluffy and perfectly seasoned every time. 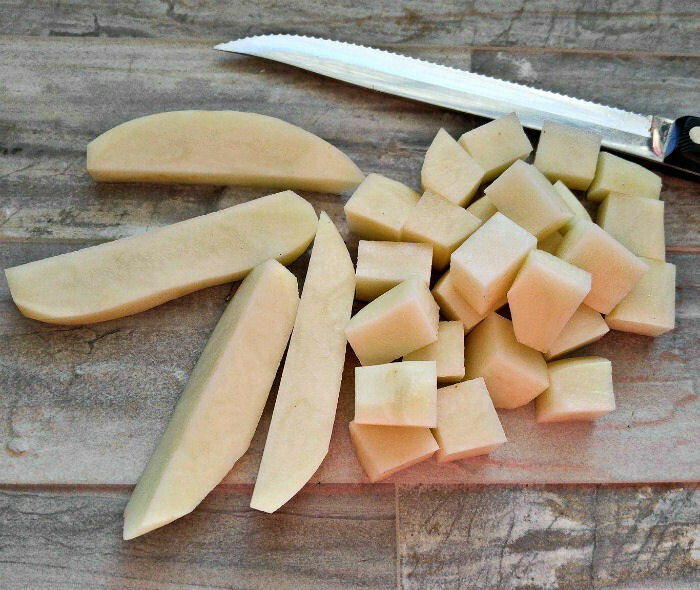 Peel the potatoes and cut them into evenly sliced chunks. Add to a pot of cold water and add 1/4 tsp of sea salt and the sliced garlic cloves. 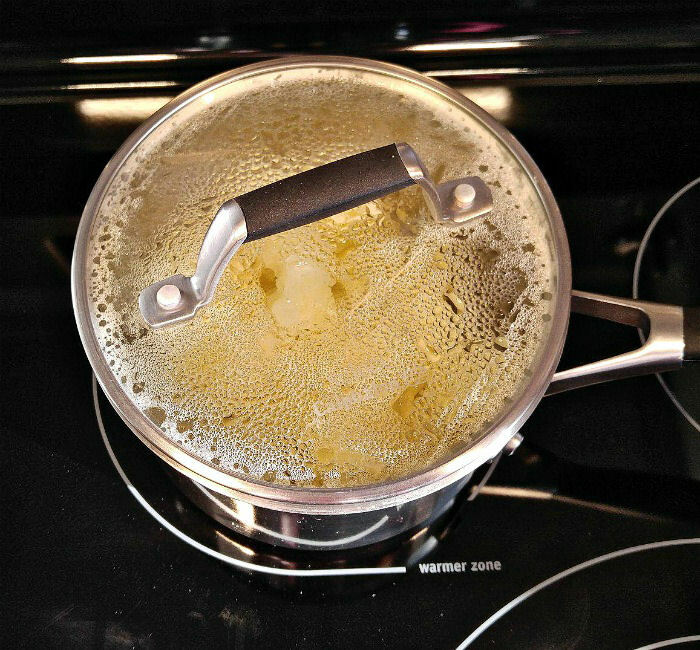 Bring the water to a boil, then reduce the heat and simmer gently for about 15 minutes until the potatoes are tender when pierced with the tip of a knife. Drain the potatoes and return them to the same pan over a very low heat, covered for 5-10 minutes to remove excess water. Add the butter in pieces and mash with a potato masher, tasting and seasoning with salt to taste.